Your Annual IPHA dues are due. 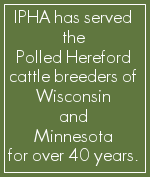 Your membership in the indianhead Polled Hereford Association supports the promotion of Herefords, social and education events for both Adults and youth. Membership is $20.00 per year. What is happening in the Beef industry? The beef consumer wants to know more these days. They want to know that the beef is safe to eat and the animal has been humanly treated and much more! and are coming to a time when we will need to have a BQA Certification to bring our animals to the market. Central Livestock said that as of Jan 1st, 2019 Tyson will only buy (or bid on) animals from BQA Certified farms. Cargill plans to require it soon, and other packers, including JBS Packerland, will announce a date when they will require it during 2019 -2020. At this moment, no cow packers are requiring it, but please anticipate that changing. HEREFORDS ARE THE FEATURED BREED! Volunteer opportunities for "2019 MN BEEF EXPO JUNIOR ACTIVITIES VOLUNTEER NEEDS" are now open ON LINE. The HEREFORD BREED is the FEATURE BREED for 2019 and we need HELP and at least 8 SALE ANIMALS.